When you ask yourself how many prospects you really have for your financial planning business, you mostly tell yourself an exaggerated story. Why? Because the real answer might be embarrassing. You keep meaning to work on getting more people interested in your financial planning service – and you’ve read plenty of tips on how to do it – but in truth, your prospect-list has barely changed. Unfortunately, when different experts give you contrasting tips, you can struggle to know which tip to follow. Fortunately, surefire, simple and scientifically proven shortcuts exist. And no one has probably told you about them. Let’s talk about scientific proof first. A study by behavioral scientists shows that the difference-quantity depends on how much progress you make in the early stages. I’ll explain by giving you an example. In one study customers in a sushi restaurant were given a loyalty card and told that they would receive a free lunch for every 10 purchases they made. There were two types of customers. One group that made little progress by buying one or two lunches. And another group who made lots of progress by buying six or seven lunches at once. It turns out that customers who made a small amount of initial progress by buying lunch just for themselves, were twice as likely to return to the restaurant if they focused on the progress they made toward the free lunch. However, those customers who made a lot of initial progress – perhaps because they bought lunch for themselves and a group of friends – were more likely to return if their attention was focused on the progress that remained to get the free lunch. Because people tend to be more motivated to complete a goal when their focus is directed towards the SMALL area. Whether that SMALL area concerns the progress already made, or the effort that remains. 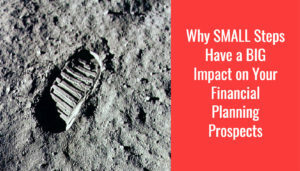 What’s the SMALLEST change financial planners can make, that has the BIGGEST impact on their number of prospects? I’ll tell you about that in a minute. Because – although a bit painful – we have to acknowledge these 3 mistakes when it comes to attracting prospects. Now, what do the words desired, envisions, plans, achieve, end-point, development all have in common? Those words focus on the far, far future. They focus on the long-term, on the end. That’s why, if you want to motivate your prospects, you shouldn’t focus on their goals at first. Because it’s way too big of a leap for them in this early phase of your relationship. What’s the opposite of SMALL? And I agree. Of course, your service is comprehensive. It’s what we do. It’s what makes us unique. It’s how we can add the most value. But try to stand in the shoes of people who don’t know you yet. Do you think they understand? Or care? No way. They haven’t got a clue about the value they get when they haven’t experienced it yet. That’s why you shouldn’t sell your prospects on your “comprehensive” service. It doesn’t motivate them. Most planners believe that when prospects make decisions, they consider all the available information at their disposal and come to an informed decision about calling them for an appointment. They believe that the best way to persuade them is to provide them with all the available information and a rational explanation for why they should check their financial planning service out. Yet, 60 years of science proves that it’s not information per se that leads people to make decisions. What does, is the context in which information is presented. You see, we are living in one of the most information-overloaded, stimulation-saturated environments that have ever existed. People just don’t have the capacity to fully consider every piece of information in their time-scarce, attention-challenged, busy lives. As a result, anyone can significantly increase their ability to influence and persuade others by not only attempting to inform people into change. But also by simply making SMALL shifts in their approach to link their message to deeply felt human motivations. A SMALL change in the setting, framing, timing, or context of how information is conveyed can dramatically alter how it is received and acted upon. There are two ways to fix those mistakes. What SMALL changes in approach can help me to attract more prospects? What SMALL shift in language can motivate others to do business with me? What SMALL adjustment can I make to my website that makes it easier for prospects to contact me? What SMALL change can I make to the way I frame my message, to appeal to more people? 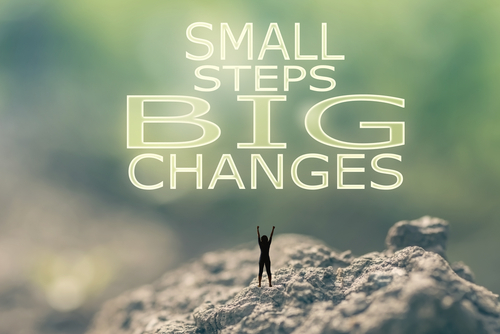 Now, I understand that sometimes it can be really difficult to step out of your day to day struggles and think about the SMALLEST changes to your service with the goal to get more prospects. You copy and paste the small steps I already used and tested. The only thing you have to do is to answer this question: What’s your SMALLEST problem you don’t seem to overcome, when it comes to selling your financial planning service to your ideal prospect? I should ask more questions to clarify and/or confirm what the prospect is saying. Giving so much information the client becomes overloaded mentally in the beginning. Getting the prospective client to open up with their real need, & also giving too much information to them in the first meeting. Giving away too much free information. The client making the decision that today their problem is something they want to address – with me. Spending too much time presenting firm capabilities and services as opposed to asking questions and listening for answers to guide the conversation to a “yes”. Getting the clients to really understand the impact of financial planning without jargon or making it overly complicated. Presenting services and solutions within the limited time the client has stated. Related to the topic of this article – Communicating my value proposition without overwhelming them with the technicalities of all that is involved. Not painting the right picture to the prospects about what would happen if they don’t address the gaps in their situation. Client doesn’t seem to believe the existence of someone outside his/her close circle who could really focus on client’s need. Trying to communicate the client-centric nature and comprehensiveness of our offer whilst also trying to make it clear that we are easy to work with. It’s a difficult balance to get right – we’ll keep working on it. Confidently answering the question – what do you do? Why they need something they never thought they needed before. Shift fokusing on the peace of mind our clients (financial planners) will bring to their clients, by using a psychological approach (we offer a training for becoming FCM Finanz Coach). Not being on auto pilot in first meetings. Getting the balance right between giving and receiving. It\’s the pathway to building a partnership but it\’s always a challenge to get it right. Creating value for the Financial Plan in minds of the client. Giving too much info on everything. In India, Advisor word is loosely used, getting Difficult to convey the message that we are \”Real Advisor\” and not \”So-called Advisor\”. For me it\’s show something new For them. Getting the initial in-person meeting. Creating a sense of urgency. make Financial Planning simple als professional. Failing to ask enough questions. Explaing the real value of my service to my clients and prospects. Differentiating myself with other financial planners to prospective clients and explaining my services in a simpler and easily understandable manner. Articulating the value of what I do and also keeping the planning separate from the products. Every year I resolve to meet with one person per day, whether it be a stranger, a client, or someone in my network of friends. I need more face-time to practice all the things I already know and have more meaningful conversations. Biggest problem, getting the prospect to the table. Our problem is overcoming our propensity to talk too much. although we listen to obtain a full picture during discovery, we still talk too much, resulting in long 2-3 hour meetings. My smallest problem is cutting right to the solution instead of listening to what motivates the client. My issue is getting prospects/referrals to sit down for an initial meeting. Getting them to feel they need my services on it tial contact. My smallest problem is going into too much detail in order to demonstrate my knowledge and \”worthiness\” probably a female thing. Problem: Providing too much information. Solution: Keep advice as simple as possible, but no simpler. A lot of my prospective clients are warm referrals. A hard part is after an interview knowing innately that the prospect will not be a good fit into my practice and perhaps they should stay with their current provider of financial services. Financial-life planning needs an engaged and willing client to commit to the concept. My probably smallest Problem: bring the prospect to push the \”call to action\” button. mine is thinking of business strategy instead of selling tactic. Focussing more on strategies and solutions rather than the client\’s aspirations and what they specifically want to get out of the interaction. To call people insteadd of writing them emails. Packing information/process into small enough bites. Not being able to get the client to tell me what \”they\” want from our relationship. Demonstrating the value of a financial planning relationship over a financial \’plan\’. Overcoming client fee objections once I have felt that I have already demonstrated value. Smallest problem is reducing the sense of overwhelm that you mentioned. I know it\’s important to focus on the big picture from a simplification standpoint, but worry that it can also create a sense of overwhelm as well. Remembering to see thru their eyes. Instilling prospective clients with the confidence to change their adviser relationship from a \”Big Name\” organisation to my business, even when the financial benefits and substantial cost reductions are already clearly evident and proven upfront and educational qualifications and experience is clearly superior in all respects. The move from a large/layered organisation to a small/nimble organisation just seems too difficult for some to digest. If this problem is solved, then my ideal clients will increase exponentially.